Place whole potatoes into microwave-safe covered dish (do not poke). While potatoes are cooking, cut mini peppers into small ¼" slices. Spray a nonstick sauté pan with cooking spray and heat to medium. Add peppers and sauté until they start to brown. Remove from pan and set aside. Remove potatoes from microwave and using a layer of paper towels covering each potato, smash it on a cutting board until 1 ¾" thick. Helpful tip: Use the side of a coffee cup or flat cooking utensil to smash the potatoes. Respray same sauté pan with cooking spray, heat on high and add smashed potatoes. Cook for 1 to 2 minutes until potatoes start to brown. 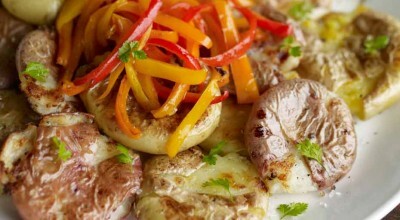 On a plate, place potatoes and layer with sour cream or yogurt (optional), peppers and cilantro. Dust with salt, chili powder and pepper to taste. Serve warm.